Early last year at the North American International Auto Show, Michelin gave us a glimpse into the future of where the rubber meets the road. They unveiled a high tech replacement for the classic 60 year old radial tire. It's a tire-wheel hybrid they have unfortunately named the Tweel. Michelin's radial tire concept which debuted in 1946, has kept the world rolling for over half a century. But it has many drawbacks that we over the years have had to learn to deal with. Flats, blow outs, pressure checks, air pumps, and other problems are facts of life with the industry standard radials. But with the advent of the tweel, all of those things may become artifacts of a pneumatic past. Tweels are airless. They consist of a semi deformable central wheel, which behaves some what like a conventional car wheel. Branching off from the wheel are flexible spokes that act as shock absorbers. Around the ring of spokes is the actual tread of the tire on a thin band. The tweels are all one piece and provide many advantages over classic radials. First and foremost is their lack of a pressure system. 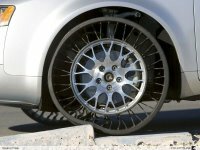 The spokes of the tweel do the job that a pneumatic cushion would, without the dangers of a flat or blow out. Secondly, because of the nature of the tweel, engineers now have have the freedom to focus on both comfort and performance. With a typical tire, there are two types of rigidity. To increase the handling of a car, you want a tire that is stiff laterally. But for a comfortable ride, you want a vertically stiff tire. With a conventional radial tire that relies on air pressure, there is a limit to the amount of one that you can have without sacrificing the other. But with the tweel, you can optimize both the lateral and vertical stiffness of the spokes and hub independently. Thus without loosing the slightest bit of comfort, you can drastically improve a cars handling. This is the real reason why engineers at Michelin are giving the tweel a spin. In the long run, it stands to completely out perform radials. For now the tweel is still in the design and testing phases. Michelin has approved the tweel for use in low weight low speed vehicles, such as Dean Kamen's tall standing stair climbing wheelchair, the iBot. They are also experimenting with military applications. Vehicles equipped with tweels are much less likely to be immobilized by explosives or other damage than vehicles with pneumatic tires. Further down the list are heavy equipment and construction vehicles that could benefit from improved performance. But the endgame sees the tweel much closer to home. Michelin has outfitted an Audi A4 with prototype tweels. Eventualy, they would like to see tweels on passenger vehicles and beyond. But there are issues that must be overcome. At high speeds, tweels suffer from both excess vibration and unacceptable noise. Michelin engineers have been working diligently to solve those problems in the year since the tweel's debut. Already the tweel has been noted "one of the most amazing inventions of 2005" by Time magazine, and "Best of Whats New" in Automotive Technology by Popular Science. Earlier this year the tweel earned a gold medal for innovation at Intermat 2006 in Paris. It looks like an early version of the "smart tires" from Niel Stephensons book Snowcrash. Wow they would be the best thing since sliced bread. I have had many flats but more anoying is slow punctures and if that can be a thing of the past then sign me up. i´m with you jonathan! As i had one accident (just broken cars no people wounded - knock on wood) due a slow puncture i´m looking forward to these tires. These look amazing, I can't wait. It does seem strange that the slow cars will get the best wheels first, or tweels. This looks great, but how well will these things hold up against the elements? I am just a little skeptacle about how well they wil take impact, wear and tear, and highway speeds. And, is the price of these tires going to outway the price it costs to repair/replace a flat?